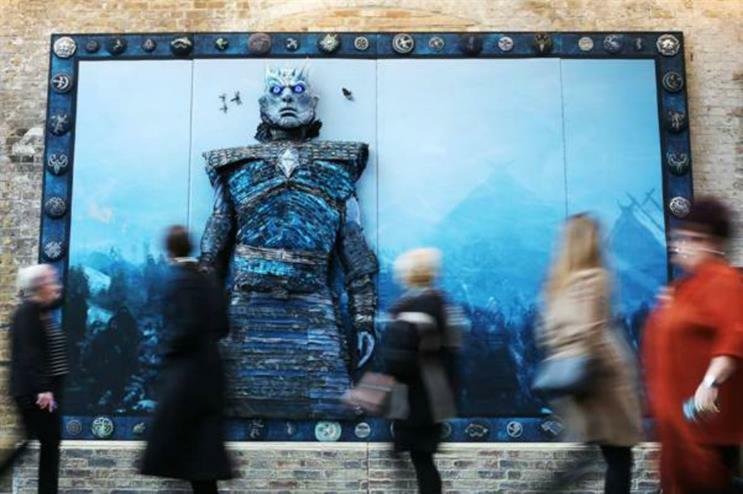 HBO has unveiled a 6m x 4m Game of Thrones-inspired embroidery artwork in London today (18 March), where it will remain until midnight tomorrow (19 March). The icy blue creation depicts one of Game of Thrones’ most memorable battle scenes – the massacre of Hardhome. The character protrudes out from the installation, his eyes staring off into the distance. Situated in Central Saint Martins’ the Crossing Gallery, the artwork took 30,000 hours to complete. Over 50 members of the UK textile community contributed to its creation, working out of locations such as Scotland, York, Kingston, Kent and Ipswich. The piece of art has been created in partnership with the Embroiderer’s Guild, the Royal School of Needlework, Fine Cell Work long-term prisoners and Hand & Lock Embroidery design room. The project is designed to celebrate the release of Game of Thrones: The Complete Fifth Season on Blu-ray and DVD. Updates and images of the artwork will be available to view via HBO’s social channels. Anthea Godfrey, artistic director, Embroiderers’ Guild and project manager, said: "This has been an amazing project that truly has brought the embroidery community together across the whole of the UK. "There’s also a huge variety of textile skills involved in the making of the piece, including digital print, surface stitchery, machine embroidery, metal thread work beading, appliqué and quilting. As many of the communities taking part are huge fans of Game of Thrones, we really are all proud to have been involved." Just last weekend (12-13) HBO installed a giant chocolate dragon's egg within Selfridges London, a move similarly designed to promote the release of the programme's fifth season.